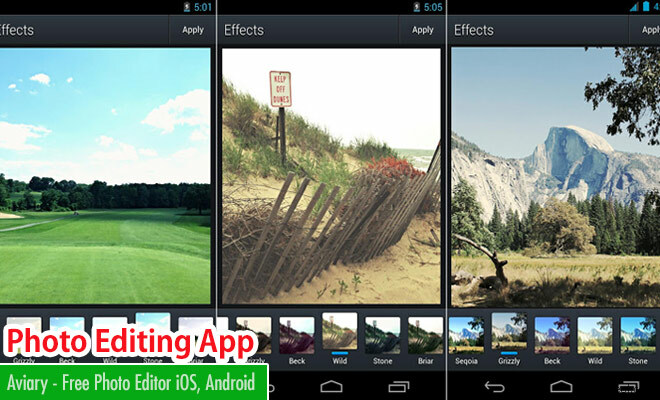 Aviary is a free photo editor which is very easy way to edit your photos on the go. It's very simple and pretty much comes with every feature required in a photo editing app. You can use professionally created filters, stickers, frames, touch-up tools allowing you to create amazing photos. New tools are being added regularly by their developers. Developers, you can easily incorporate Aviary app into your design by changing it's UI and colors. Contact support.aviary.com/ for more information. According to Aviary website, "You can experiment with dozens of filters to create artful effects. Sharpen, soften or saturate photos for just the right look. Draw your own captions and doodles and post to your favorite social channels. Aviary comes stocked with a collection of creative supplies, including stickers, frames, overlays and effects made by artists around the world.Jump-start your creativity with our curated stream of photos made with Aviary. Sign in with your Adobe ID to connect Aviary to Adobe Creative Cloud and access all your filters and tool packs from any device, anywhere.